It’s a matchup that may seem as unlikely as, say, Chris Gregoire and Dino Rossi, but both sides insist it’s a good fit: a collaborative study between Bastyr University and the University of Washington on how an extract from a mushroom common to forests around the world can help heal breast and prostate cancer patients. 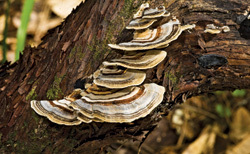 Joining conventional Western medicine with the burgeoning world of natural treatments is a humble mushroom called Trametes versicolor, or the turkey tail—a tough and colorful fungus often brewed into a bitter-tasting tea by natural-medicine devotees, and the centerpiece of a $4.5 million grant from the National Institutes of Health (NIH). Seattle’s Fred Hutchinson Cancer Research Center and the University of Minnesota are also participating in the study. Such collaborations are on the rise: The current study follows a $3.1 million NIH grant Bastyr received jointly with the Hutch last summer to research complementary and integrative care for breast cancer, that is, how to marry traditional cancer care—albeit cutting edge—with natural therapies, such as herbs. In 1977, Standish says, the Japanese medical community approved the use of turkey tail extract in the treatment of cancer. Nowadays, it’s used by many Japanese oncologists in standard cancer-treatment protocols to bolster the immune system, with the aim of preventing a recurrence. Hailing Lu, M.D., Ph.D., research assistant professor of oncology in the University of Washington’s Tumor Vaccine Group, is one of the UW investigators on the mushroom study. Lu, who is also working on developing vaccines to prevent breast cancer, says the project with Bastyr researchers is a positive way to connect Western and Asian medicine, something that’s extremely meaningful to her. In four years’ time, the Bastyr-UW study aims to produce this definitive research—and perhaps an even stronger bond between conventional medicine and natural medicine.